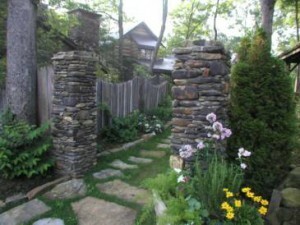 Spring is a great time to inspect Highlands NC homes. Winter weather can be hard on a property. As a result, taking the time to inspect a home inside and out can be a great part of the spring cleaning process. Changing seasons offers a chance for renewal, as true for people as it is for Highlands NC homes. While you are cleaning your Highlands NC home take note of what is working well and what isn’t. For example, while cleaning windows make sure each one opens and shuts properly. Additionally, make sure there is a screen for each window. The same holds true for doors. Changing temperatures and humidity levels can make materials like wood swell and retract. Making sure your windows and doors operate properly is a good annual inspection item. While you are inspecting your Highlands NC property take the time to check your irrigation system. Making sure heads have not been damaged and that no pooling or leaking occurs. This is a great time to rake up the grass as well. Raking the grass when spring arrives awakens roots and gets rid of dead grass and any leaves that were not raked up in the fall. Contact me, Lynn Kimball, today to learn more about Highlands NC real estate. I welcome the opportunity to update you on market conditions while answering all of your buying and selling questions. Let my knowledge and experience serve as your guide to Highlands NC homes. Click here to read “To-Dos: Your April Home Checklist” from Houzz.